Today I've had a rare whole day with my hubby all to myself. We attempted to do a little Christmas shopping but failed miserably, only buying one gift for a relative in France. We spent a lot of our time discussing why we dislike shopping and in particular the Christmas retail experience. 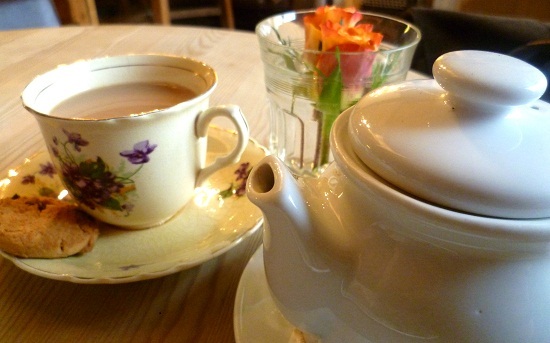 We abandoned the shopping at lunchtime and decided to head to our favourite café for sustenance and tea. Situated in a pretty village with delicious food served on beautiful vintage china it was the perfect antidote to the large retail outlet we visited earlier in the day. Giving presents is lovely and some gift buying is inevitable at Christmas but I think people place far too much emphasis on consumption and get far too carried away with their spending at this time of year. After today's experience I am determined to limit my shopping trips and exposure to advertising as much as possible. How about you? What are you views on the commercialism of Christmas? Hope you get time for some tea and chat this weekend.